Organizational Forms are a very useful organization tool, can streamline and improve many repetitive processes. For example – a prepared in advance templates, that used as a reply template for customers, applying for a holiday and much more. The first secret that most of us do not know is, that Outlook includes powerful built-in tools that can help us to create this Forms, and send them to required recipients. The second secret that most of us do not know is that Exchange server include a built-in solution that created for the purpose of – storing this Forms, and share them between our organization users. 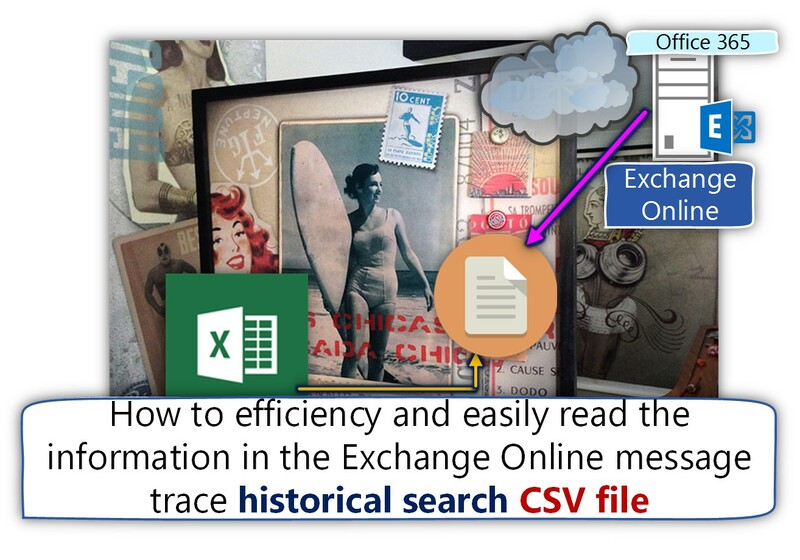 The “store” that Exchange server provides is implemented via Exchange system Public folder. In the current article, we will learn how to create the “server-side side store” for Organizational Forms. 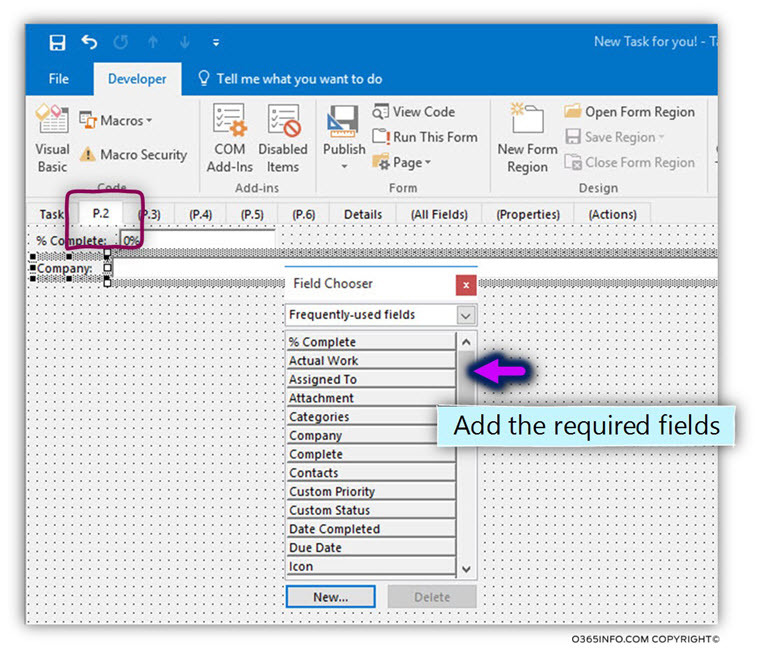 In the second part, we will review how to build this “Outlook forms,” how to publish the Form publicly, and how to send E-mail message based on a particular Form. As mentioned, Outlook includes a very useful tool that enables each user, to create for himself a custom temple that described as a “Form”. 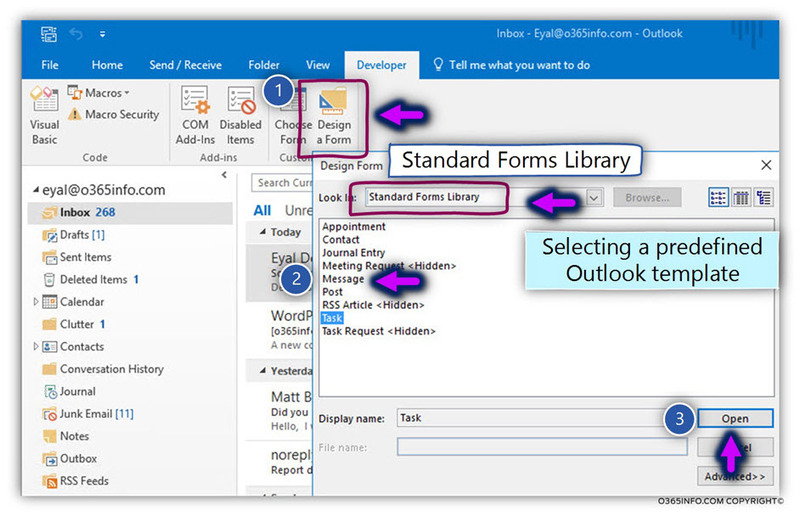 The Outlook Form based on Outlook well knows items such as “standard E-mail template,” a “Task template,” calendar meeting template” and so on. 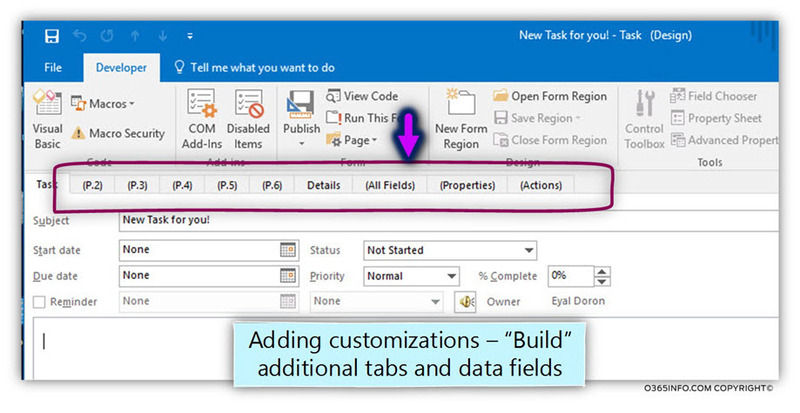 The user can use one of these “Outlook templates” as a baseline and add many times of customization to the baseline template. The customization of the Form can be minimal such as – adding a predefined text to the E-mail message, predefined recipients or a very advanced and sophisticated customization that includes calculated values, code and so on. 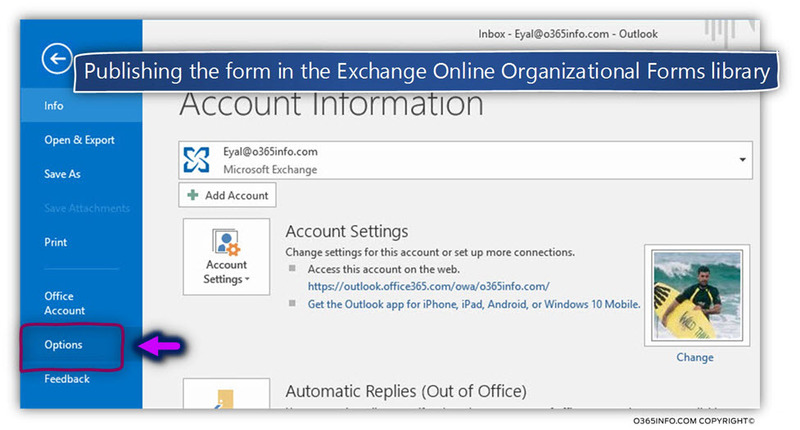 The custom Form that created can save in the user mailbox or, stored in a central location (Exchange server) which is available other Exchange recipients. The store that Exchange server allocates to this “Form central store”, is implemented by using a specific system Public folder – EFORMS REGISTR, which is usually named – Organizational Forms. In Exchange Online based environment this “particular Public folder”, need to be created by the Exchange Online administrator. Also, the Exchange Online administrator, need to assign the required permissions to the Exchange recipient, which are going to save the custom Forms in the Organizational Forms store (The Form Manager). When Exchange recipient keeps a Form in the Organizational Forms store, we use the term “publish”, because the recipient is storing a Form that will be shared (published) with of the rest of the Exchange recipients. 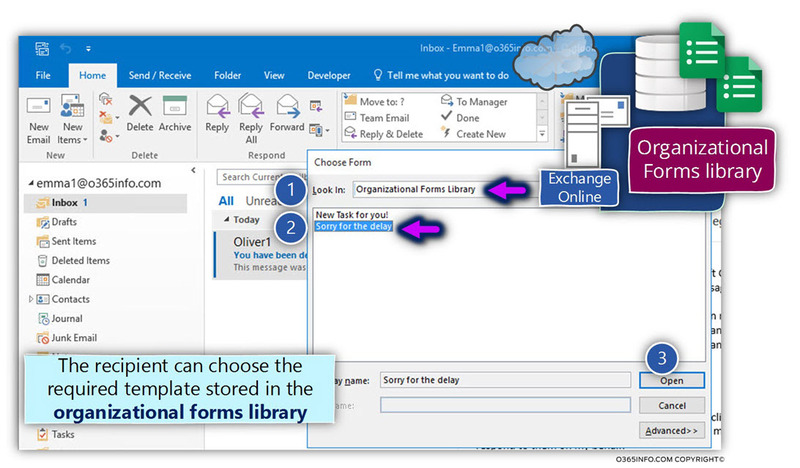 Creating the Organizational Forms library store – this is a “one-time step,” in which we create the required store for the Forms, that shared between our organization users. The creation of the Organizational Forms library is implemented by using PowerShell for creating the particular System Public Folder. Assign the required permissions to the “Form Manager creator” – technically speaking, there is no such role. Most of the time, only specific users will be assigned with the required permissions that will enable them to publish (save) a Form that they have created in the Organizational Forms library store. The user who will publish the Form will need Read + Write permissions to the Organizational Forms library store. Creating the Form – the step in which a particular user creates and designs a Form for a specific organizational need. Saving the Form in the personal form library – in the first step, the creator of the Form will need to save the Form locally in his mailbox. 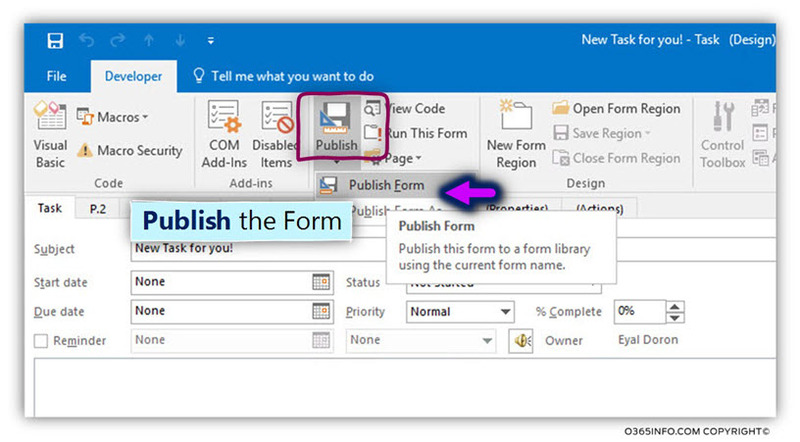 Publishing the form in the Exchange Online Organizational Forms library – after the Form saved locally, the Form creator will need to save the Form in the public store meaning – publish the Form to the Organizational Forms library store. 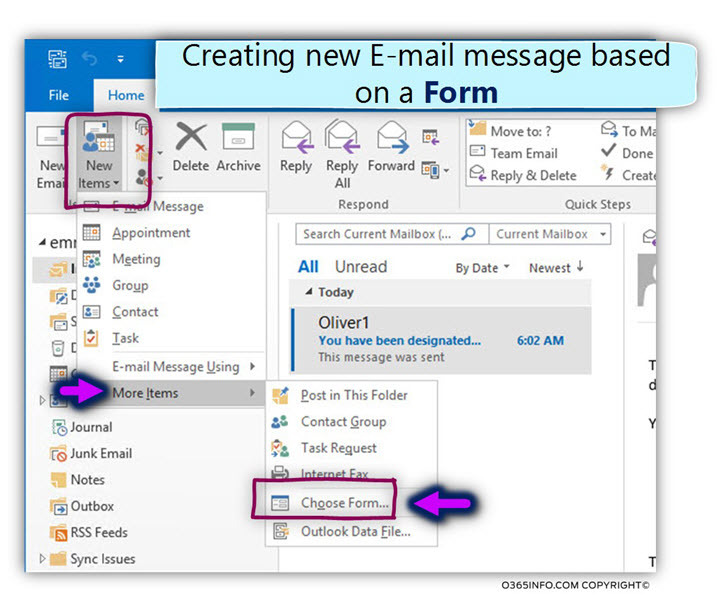 Using the Form as E-mail template – when the organization user needs to use a specific Form that was published, he will use Outlook to “fetch” and select the required Form that they want to use. The basic assumption is that you have already created the required infrastructure of a Public folder in the Exchange Online server. This step implemented by the Exchange Online administrator using a PowerShell commands. Technically speaking, the best practice is to create a hierarchy of permissions. 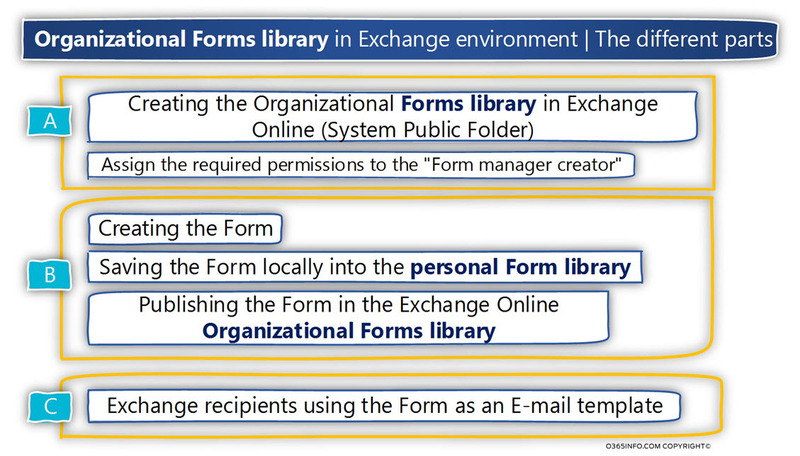 Layer 1 – the Exchange Online administrator will have the Owner permissions to the Organizational Forms store. Layer 2 – The Organizational Forms library store “creator.” These are the users who will have the required permissions of storing (publishing) Forms in the Organizational Forms library. This user needs to have the Publishing Editor permissions. Layer 3 – The Organizational users – the user who will have the permissions to use the Forms that stored in the Organizational Forms library store. The permissions to “all Exchange Online user” are configured by using the “default” object. The permissions that are assigned to the “Default recipient” are Author permissions. Generally speaking, the task of creating a “new Public folder” is implemented by the Exchange Online administrator using the Exchange Online web admin interface or, by a user who has the required permissions using Outlook mail client. The Organizational Forms Library is a special case because, the Organizational Forms Library implemented by using a particular system Public Folder, which can be created and managed only by using PowerShell. The Organizational Forms library store is a sub-Public folder in the existing Public Folder infrastructure. The creation of the Organizational Forms library store + the assignment of the required permissions is implemented by using PowerShell commands. 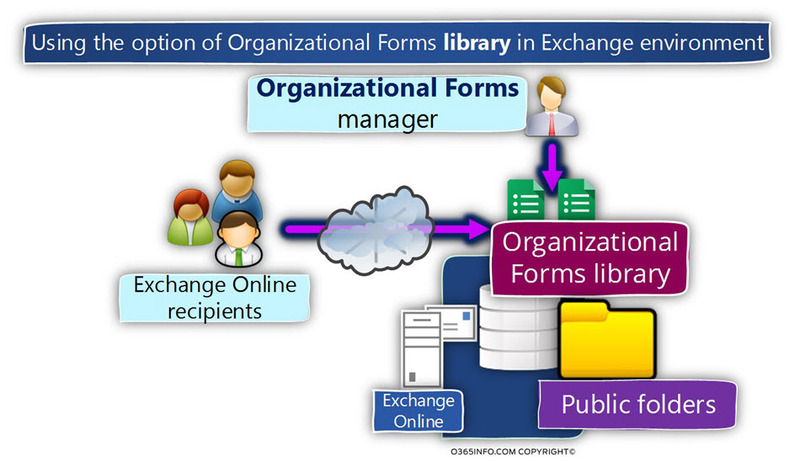 We will need to set the language setting of the Exchange Online Organizational Forms Library. In the following example, we set the language code to en-US. In the following screenshot, we can see that by default, the existing permissions for the Organizational Forms Library Public Folder include the Author permissions to the default user (authenticated user), and the None permissions for anonymous users (non-authenticated user). In this step, we assign the required permissions, to Exchange Online Administrator Brad. The permissions that we assign to Brad are the “owner” permissions on the Organizational Forms Library Public Folder. In our scenario, the Forms Manager is a user named – Eyal. 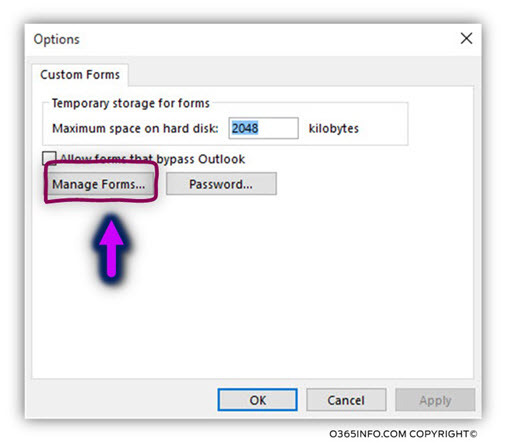 Get-PublicFolderClientPermission "\NON_IPM_SUBTREE\EFORMS REGISTRY\Organizational Forms Library"
Creating and design the required Outlook Form. 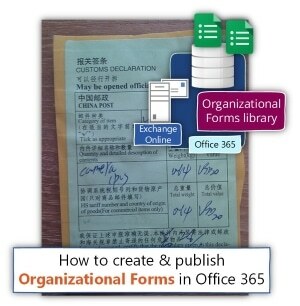 Publishing the Form to the Organizational Forms Library Public Folder. 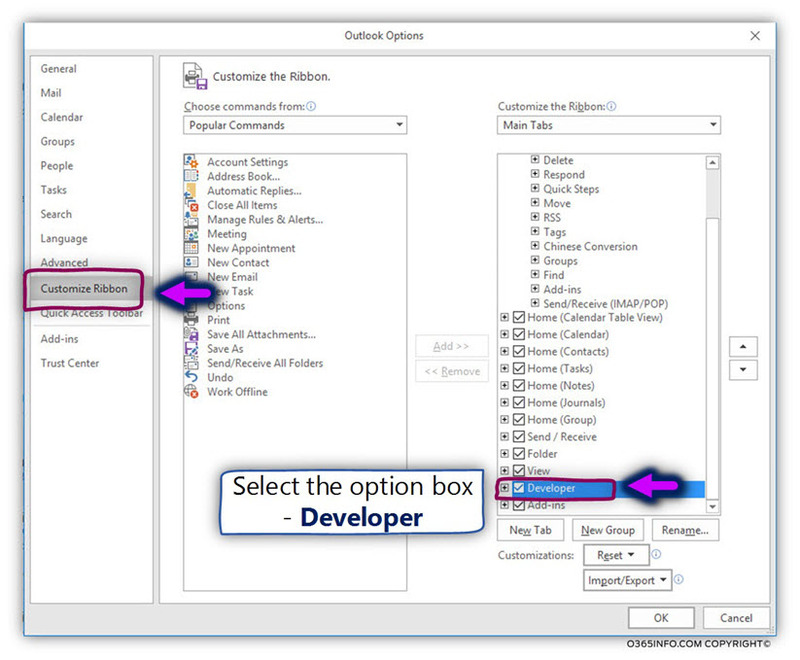 The Outlook developer ribbon is not added by default to the standard Outlook ribbon. 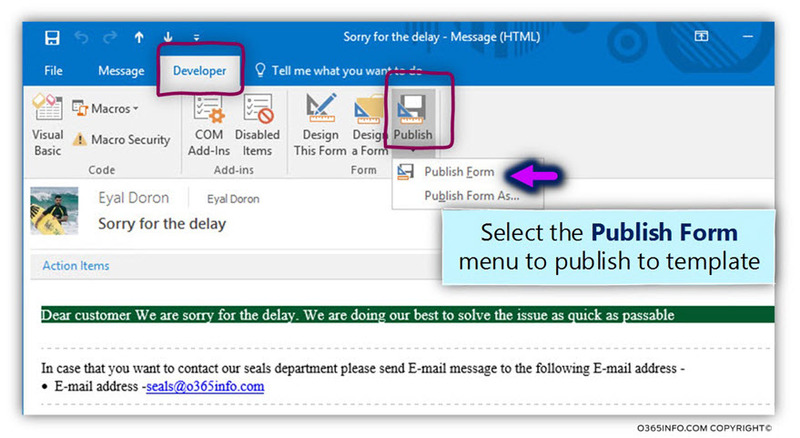 In the following section, we will review how to add the Outlook developer ribbon to the Outlook client. In the following screenshot, we can see a “new ribbon” appear on the Outlook interface. 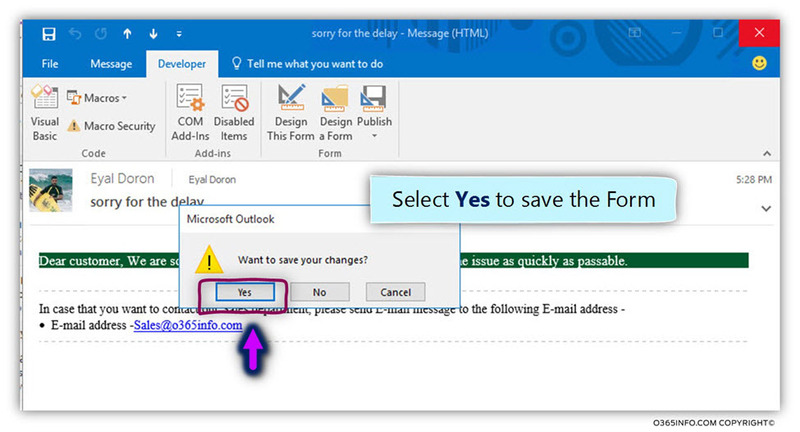 In the following sections, we will review how to create a new Outlook Form. 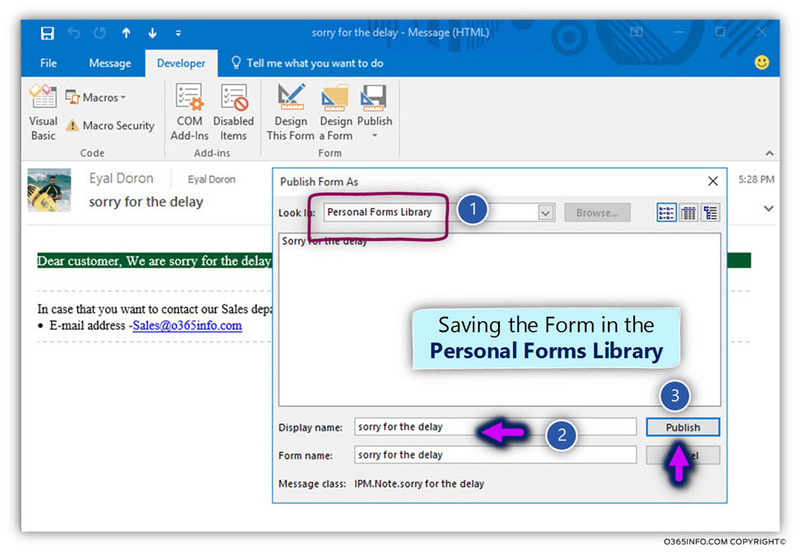 We will examine two ways that we can use for creating Outlook Forms that will be published (saved) in the Organizational Forms Library Public Folder. 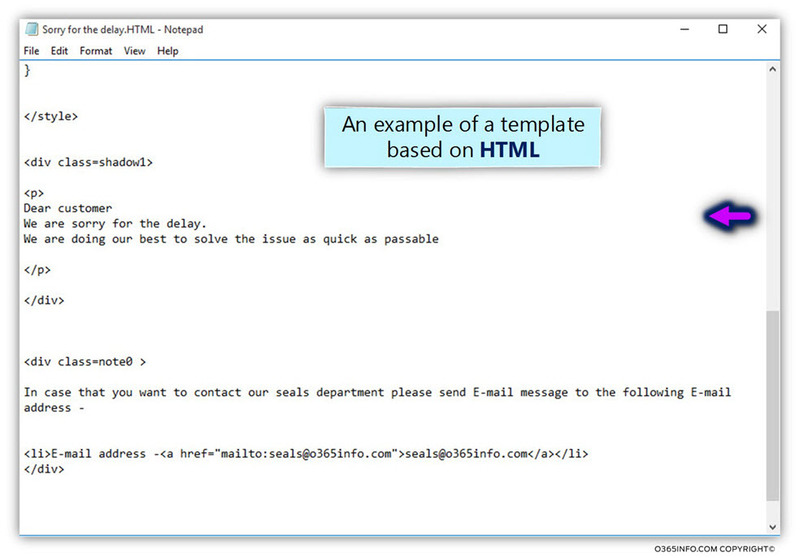 In the following screenshot, we can see the E-mail message template. We can add additional Tabs to the E-mail Form, other mail fields, add custom code and so on. After we have finished adding all the required customizations to the E-mail Form, we need to save the Form. In the first phase, we will save (publish) the Form locally in the user Mailbox. Later, we will copy the Form, to the Organizational Forms Library Public Folder, by publishing the Form. 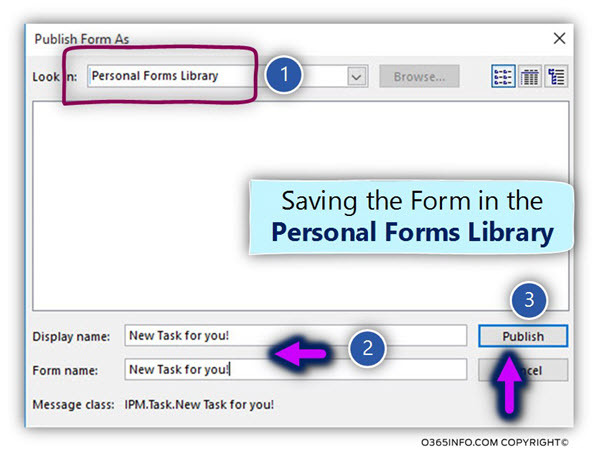 We will save the “New Form” in the Personal Forms Library. Choose the name whom you want to assign to the Form. When we wish to close the Form window, we need to click “Yes” for saving the Form settings. 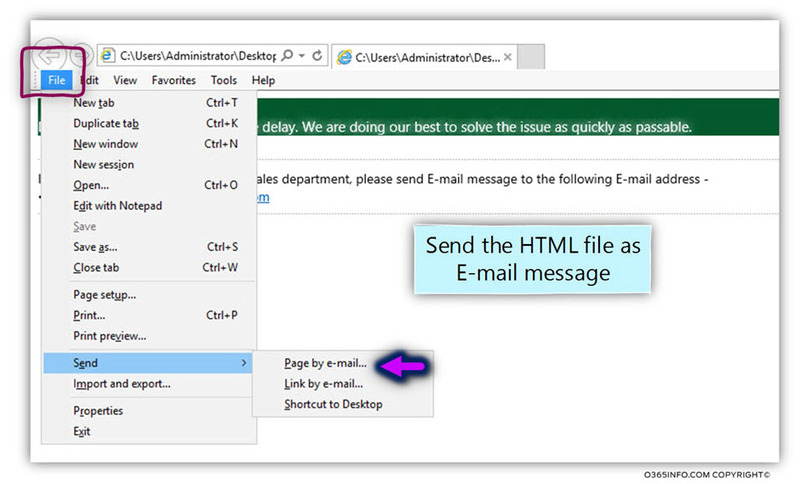 In the following section, I would like to briefly review the additional method of creating a custom Outlook Form that is based on an HTML template. Create the required HTML code that includes the necessary TEXT (the content) + the necessary CSS style. In the following screenshot, we can see an example, in such HTML code (you can download the sample by using the following link). To be able to use the HTML code as a Form, we will need to open the HTML file using a browser. 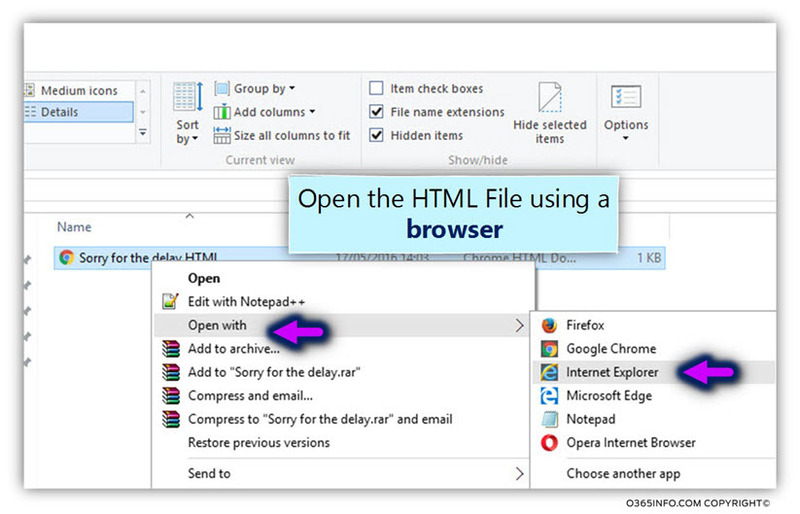 In the following example, we use Internet Explorer for opening the HTML file. Send the E-mail to the recipient who acts as the “Form Manager”. Choose the name which you want to assign to the New Form. In the following section, we review the process of publishing the Form that created in the former section, and how to manage the Exchange Online Organizational Forms library store. In the following step, we will copy the Form that was stored in the Personal Forms Library in the Exchange Online Organizational Forms library store. On the “right side” the content of the Personal Forms library (the personal user store). To copy the custom Forms stored locally (number 1) to the Organizational Forms library store, we need to select the name of the required Form and click on the Copy button (number 2). 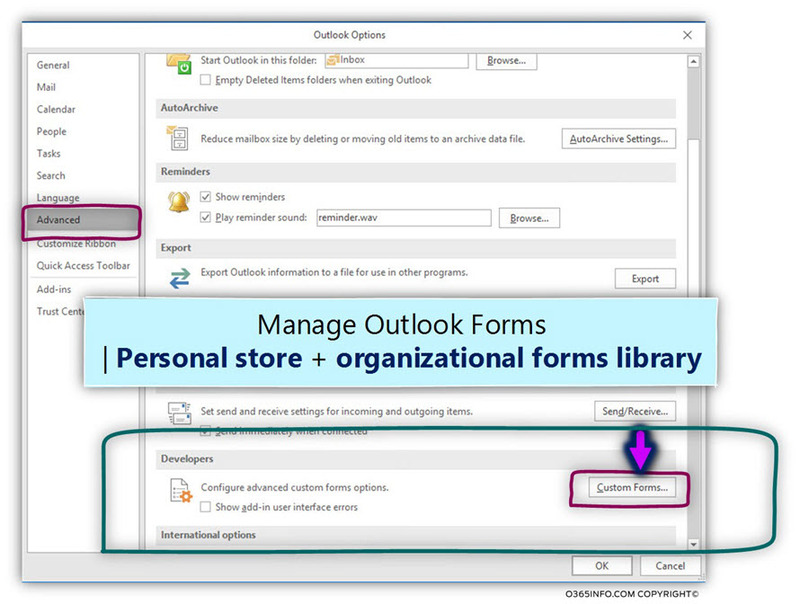 In the following screenshot, we can see the Forms copied to the organizational Form store (number 3). Click – Close (number 4). This is the “last step” in our Organizational Forms library store journey. 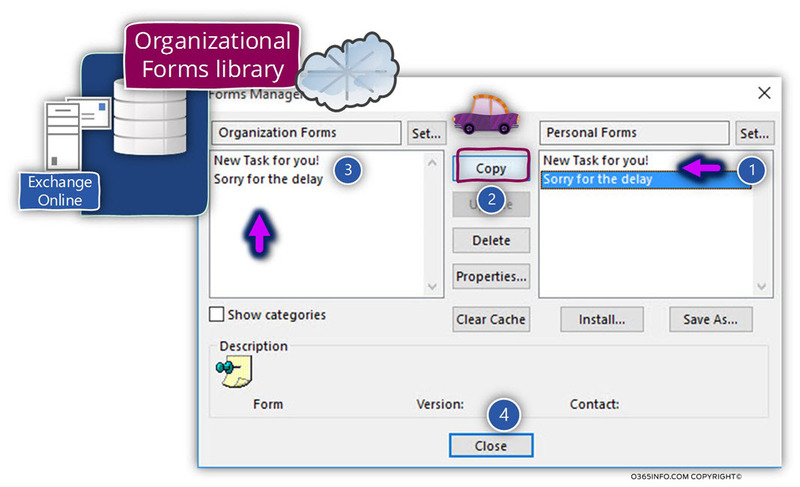 In this phase, the custom Forms were already created and published by the “Forms Manager” to the Organizational Forms library store. 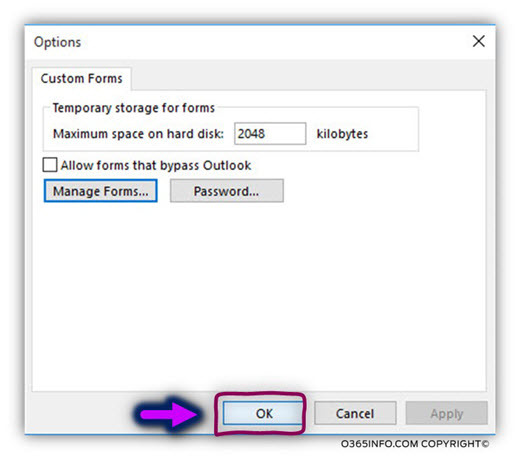 Now, we will review how an organization’s user can use the Form when using Outlook. 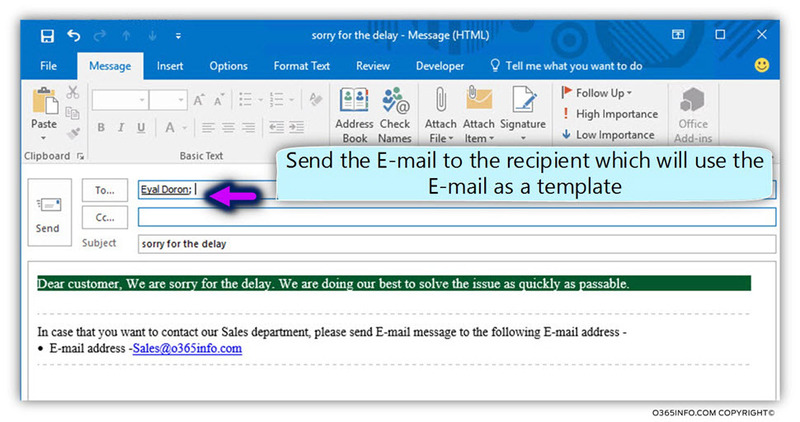 In the following screenshot, we can see that the “new E-mail message” is based on the Form that serves as a Template. Organizational Forms are a very effective organization tool, can streamline and improve many repetitive processes. For example – a prepared in advance templates, that will be used as a reply template for customers, applying for a holiday and much more.